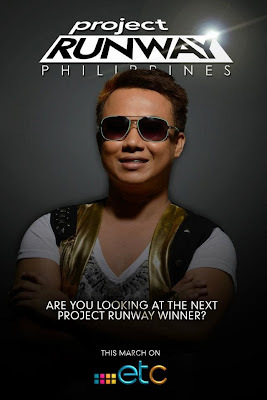 After Roy Gamboa for Pinoy Big Brother Unlimited, here comes another pride from our little town of Villasis, Pangasinan – Glenn Gonzales for Project Runway Philippines Season 3. Project Runway Philippines Season 3 is now hosted by Pinay supermodel Tweety De Leon–Gonzalez with resident panel judges Rajo Laurel, Apples Aberin, and Jojie Lloren. You can also catch guest judges. Inno Sotto and Camille Co had already graced the show as guest judges from previous episodes. Going back to Glenn Gonzalez, I saw his banner posted over our town’s public market on my way to SM Rosales. I know he is part of the show long before the season premiered so I was wondering why I didn’t write about him yet. Now that the show is already on air every Sunday at 8 PM on ETC, it’s high time we get to read more about him. Coincidence or not but Glenn Gonzales is the younger brother of one of my classmates in high school. My younger brother on the other hand is a classmate of Glenn. We are not really of close acquaintance but I know his siblings at least, as we were all schoolmates back in high school. As for Glenn, he was already promoting about his participation on the show over Facebook long before it started airing at the ETC channel. We already extended our support with wishes of “good luck” and what not, but I believe this entry will help gather greater support for him, especially in the online world. Glenn Gonzales can be considered a novice when it comes to the world of designing although he actually studied formally through a designer’s school. On Project Runway Philippines, he is dubbed as an apprentice. At 26, he has a lot more to learn compared with more experienced designers battling alongside him on the show. What makes him stand out among the rest of the contenders though is his passion to pursue his craft despite the fact that he is suffering from congenital glaucoma. He is the only contestant who uses a single eye. Watch Glenn in action at Project Runway Philippines Season 3 on ETC every Sunday night at 8 PM with replays on varying schedules. You know ETC with all its rerun of primetime shows. Most of which are during afternoons and weekends so just tune in and you might just catch a replay episode. As per ETC’s site though, the rerun of Project Runway Philippines Season 3 is scheduled as follows: Monday at 3 PM, Saturday at 7 PM, and Sunday 10 AM. Catch Glenn Gonzales sketch, stitch, sew, hem, cut, and what not at iACADEMY as they call it. Show some love and vote for him or extend your support in any way you can. Good luck Glenn Gonzalez! taga saan ka po sa villasis?